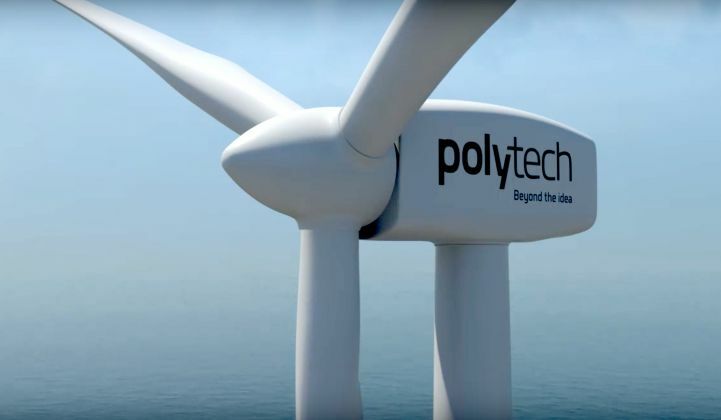 Danish company PolyTech believes its polyurethane shell can protect against wind turbine blade degradation. “Blade leading-edge erosion has become a very critical issue for the wind energy industry." Exposure to sunlight, freezing temperatures and precipitation can erode the leading edge of wind turbine blades, shortening the life of the blade and reducing the overall productivity of the turbine. With turbine blades getting longer, from around 50 meters just a few years ago to 80 meters or more today, the force of natural elements working to degrade a blade’s leading edge has increased. A Danish company believes it has found a solution. PolyTech’s ELLE (Ever Lasting Leading Edge) is a polyurethane shell applied to turbine blade tips. The product has been likened to a “swim cap” for turbine blades. Aaron Barr, senior consultant, Wood Mackenzie Power & Renewables, confirmed in an email that blade protection is becoming an increasingly important concern for project owners. Barr specializes in wind turbine technology and operations and maintenance. The solution most often used by project owners today is tape that must be replaced at least a few times during a turbine’s life, he said. Not surprisingly, it’s much cheaper to install blade protection in the factory. So how much can installing ELLE protection save wind turbine project owners? “There is not an easy answer to that. The costs vary a lot,” said Kirkegaard. The range depends on factors such as the project site, weather and the size of the turbines. PolyTech told the Denmark-based publication Energy Watch, “In a modeled example, a 3 percent production loss for 400 MW offshore wind farm in the North Sea with 60 to 70 turbines would amount to DKK 20 million [$3.085 million] in productivity loss, if the turbines are allowed to operate for one year without repair.” ELLE could theoretically get at a sizable chunk of that number. Kirkegaard told GTM that 30 wind turbine project operators and OEMs have installed the ELLE product on a total of 3,000 turbine blades globally. He declined to name the customers. Companies are not ready to go public, he said, because they are still testing ELLE. “A vast number of operators are testing the product on a few turbines before going big,” he said. GTM asked about the performance of turbines already outfitted with ELLE protection. “None have failed — but that’s not the same as lasting 25 years,” said Kirkegaard. Wood Mackenzie’s Barr said because ELLE is just entering the market he couldn’t comment on its performance or effectiveness compared to competing products. He cautioned that ELLE may not be a comprehensive solution to blade degradation, though.